This section describes a few scenarios for implementing redundant monitoring hosts an various types of network layouts. With redundant hosts, you can maintain the ability to monitor your network when the primary host that runs Nagios fails or when portions of your network become unreachable. Note: If you are just learning how to use Nagios, I would suggest not trying to implement redudancy until you have becoming familiar with the prerequisites I've laid out. Redundancy is a relatively complicated issue to understand, and even more difficult to implement properly. This is an easy (and naive) method of implementing redundant monitoring hosts on your network and it will only protect against a limited number of failures. More complex setups are necessary in order to provide smarter redundancy, better redundancy across different network segments, etc. The "master" host that runs Nagios is down or.. 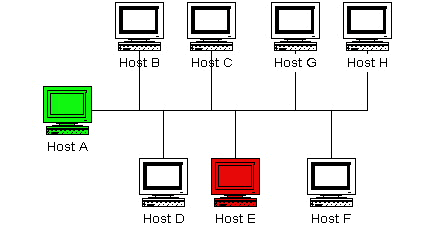 The diagram below shows a very simple network setup. For this scenario I will be assuming that hosts A and E are both running Nagios and are monitoring all the hosts shown. Host A will be considered the "master" host and host E will be considered the "slave" host. The host definition for host A (in the host E configuration file) should have a host event handler defined. Lets say the name of the host event handler is handle-master-host-event. The configuration file on host E should have a service defined to check the status of the Nagios process on host A. Lets assume that you define this service check to run the check_nagios plugin on host A. This can be done by using one of the methods described in this FAQ (update this!). The service definition for the Nagios process check on host A should have an event handler defined. Lets say the name of the service event handler is handle-master-proc-event. This assumes that you have placed the event handler scripts in the /usr/local/nagios/libexec/eventhandlers directory. You may place them anywhere you wish, but you'll need to modify the examples I've given here. The slave host (host E) initially has notifications disabled, so it won't send out any host or service notifications while the Nagios process on the master host (host A) is still running. The master host (host A) goes down and the handle-master-host-event host event handler is executed. The Nagios process on the master host (host A) stops running and the handle-master-proc-event service event handler is executed. When the Nagios process on the slave host (host E) has notifications enabled, it will be able to send out notifications about any service or host problems or recoveries. At this point host E has effectively taken over the responsibility of notifying contacts of host and service problems! Host A recovers and the handle-master-host-event host event handler is executed. The Nagios process on host A recovers and the handle-master-proc-event service event handler is executed. When the Nagios process on host E has notifications disabled, it will not send out notifications about any service or host problems or recoveries. At this point host E has handed over the responsibilities of notifying contacts of problems to the Nagios process on host A. Everything is now as it was when we first started! Ensuring that the Nagios process on host E (re)checks one or more services at a high frequency. This is done by using the check_interval and retry_interval arguments in each service definition. Ensuring that the number of host rechecks for host A (on host E) allow for fast detection of host problems. This is done by using the max_check_attempts argument in the host definition. Increase the frequency of external command checks on host E. This is done by modifying the command_check_interval option in the main configuration file. The exact lag times between the transfer of monitoring responsibilities will vary depending on how many services you have defined, the interval at which services are checked, and a lot of pure chance. At any rate, its definitely better than nothing. Here is one thing you should be aware of... If host A goes down, host E will have notifications enabled and take over the responsibilities of notifying contacts of problems. When host A recovers, host E will have notifications disabled. If - when host A recovers - the Nagios process on host A does not start up properly, there will be a period of time when neither host is notifying contacts of problems! Fortunately, the service check logic in Nagios accounts for this. The next time the Nagios process on host E checks the status of the Nagios process on host A, it will find that it is not running. Host E will then have notifications enabled again and take over all responsibilities of notifying contacts of problems. The exact amount of time that neither host is monitoring the network is hard to determine. Obviously, this period can be minimized by increasing the frequency of service checks (on host E) of the Nagios process on host A. The rest is up to pure chance, but the total "blackout" time shouldn't be too bad. Failover monitoring is similiar to, but slightly different than redundant monitoring (as discussed above in scenario 1). The basic goal of failover monitoring is to have the Nagios process on the slave host sit idle while the Nagios process on the master host is running. If the process on the master host stops running (or if the host goes down), the Nagios process on the slave host starts monitoring everything. Disable active service checks and notifications on the slave host using the execute_service_checks and enable_notifications directives. This will prevent the slave host from monitoring hosts and services and sending out notifications while the Nagios process on the master host is still up and running. Make sure you also have the check_external_commands directive enabled on the slave host. Set up a cron job on the slave host that periodically (say every minute) runs a script that checks the staus of the Nagios process on the master host (using the check_nrpe plugin on the slave host and the nrpe daemon and check_nagios plugin on the master host). The script should check the return code of the check_nrpe plugin . If it returns a non-OK state, the script should send the appropriate commands to the external command file to enable both notifications and active service checks. If the plugin returns an OK state, the script should send commands to the external command file to disable both notifications and active checks. By doing this you end up with only one process monitoring hosts and services at a time, which is much more efficient that monitoring everything twice. Also of note, you don't need to define host and service handlers as mentioned in scenario 1 because things are handled differently. At this point, you have implemented a very basic failover monitoring setup. However, there is one more thing you should consider doing to make things work smoother. The big problem with the way things have been setup thus far is the fact that the slave host doesn't have the current status of any services or hosts at the time it takes over the job of monitoring. One way to solve this problem is to enable the ocsp command on the master host and have it send all service check results to the slave host using the nsca addon. The slave host will then have up-to-date status information for all services at the time it takes over the job of monitoring things. Since active service checks are not enabled on the slave host, it will not actively run any service checks. However, it will execute host checks if necessary. This means that both the master and slave hosts will be executing host checks as needed, which is not really a big deal since the majority of monitoring deals with service checks. That's pretty much it as far as setup goes.